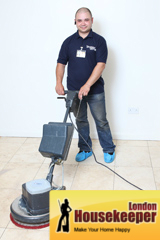 Make the arrangements for your hard floor cleaning in London without any of the usual messing around. You can book your service 24 hours a day, and set it up to happen any day of the week or even at the weekend. This service is ideal for all types of hard flooring material. For wooden we'll use the brush heads of our rotary equipment alone, while we have specialist solutions for most other materials. We can provide a full stripping and resealing option, or just a high-quality polish - whatever your flooring needs to stay in top condition. We'll always start your service off with a free, no-obligation quote on the work you need to be done. Give us a quick call today to get started. Your choice of booking slot to fit in around your schedule including weekend and bank holiday options. Contact us 020 3746 2485 to set up your service, or simply to request your free, no-obligation quotation. You'll find someone here 24 hours a day, every day of the week. Q. What if my flooring is made out of an unusual material? A. Tell us about your floor in detail when you call to book. Rest assured, we'll have the solutions to treat it, thanks to our large range of Prochem-supplied equipment. Q. Do you offer regular appointments at all? A. We're happy to keep your hard flooring in the best possible condition on an ongoing basis, and can even sometimes give you money off when you book multiple appointments on a regular basis. Q. Can I just get a polishing session for my floor? A. Absolutely. We offer both full stripping and resealing, and a hard floor polishing option if your floor hasn't seen too much wear and tear.